Happy tuesday. 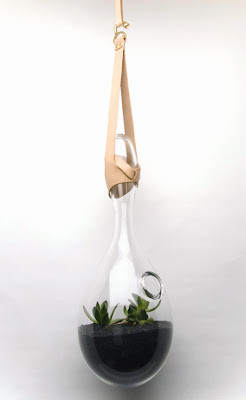 Here is something to ponder: does your hanging terrarium need a neat, buttery-soft looking leather noose holder contraption? If so, look no further than Esque Design Nest Terrarium, originally spotted at the lovely Design Milk. Our goal was to create modern heirlooms, so exotic and unique, that it truly would be an object passed on to generations to come. Juxtapositions of symbolism. What is the most extreme hyper-masculine version of a Ice Bucket, or a Decanter, a hanging terrarium? Our aim was to distort everyday items typically thought as gender specific. Flirtations with scale and decadent fantasy. Anachronisms. Out of time, out of place. Revival of the fittest. Now that survival is out of the way, what’s next? Horticulture?